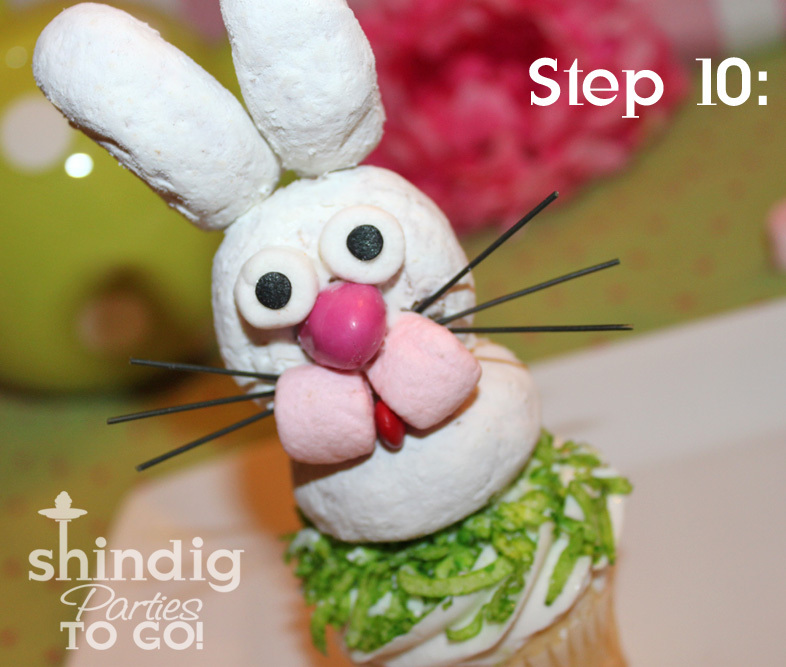 Today I'm sharing a fun little Easter Bunny Cupcake that was a real hit last Easter. 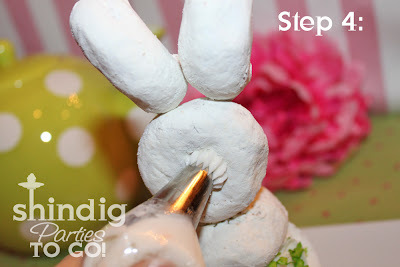 I love the idea of a no-bake dessert and wanted to make a simple little Easter treat. 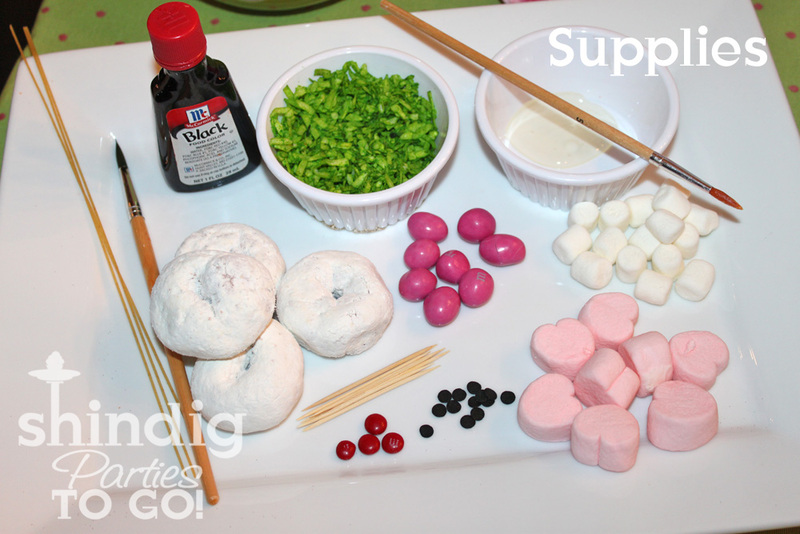 I decided to use a few supplies that I had in the house and create something special for the kids, Mr. Easter Donut Bunny! He would also make an adorable centerpiece for a plate of colorful cupcakes if you didn't want to make a pile of donut bunny cupcakes. I think putting him in the center surrounded by pastel colored cupcakes with some easy embellishments like chocolate eggs and green-dyed coconut for "grass" would be so sweet. 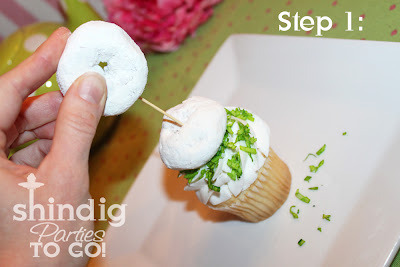 Step 1: Add a little colored coconut to the top of your cupcake (you can color coconut by placing a little green food dye in a small plastic container with a lid and adding coconut - then put the lid on and shake until the coconut is dyed). Put a donut on top of your cupcake and insert a toothpick into another donut and stand it on top of the first donut. 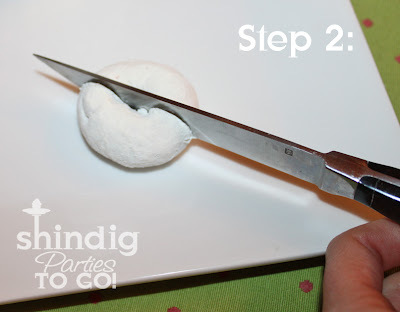 Step 2: Cut another donut in half to make bunny ears. Step 3: Add a half of a toothpick to each ear and stick them on top of your middle donut. Step 4: Add a little white frosting to the center of your middle donut. Step 5: Make a nose by placing a pink peanut M&M or a jelly bean into the icing and hold for a minute until it sticks. Step 6: Cut a small white marshmallow in half for the eyes. 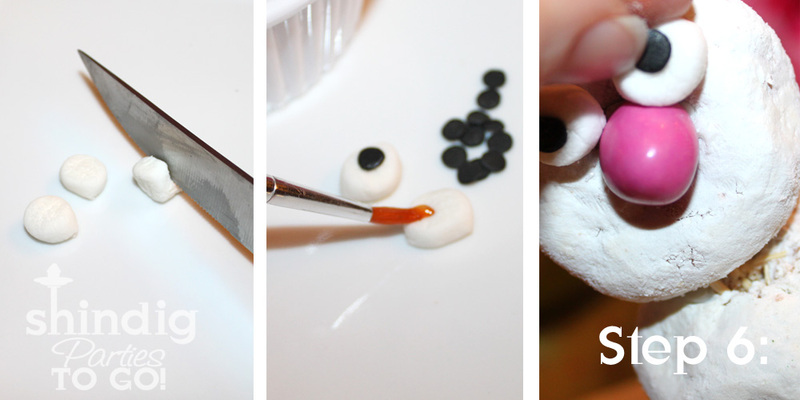 Next, add a little Karo syrup to your marshmallow with a paintbrush and adhere a round black sprinkle to the center for an eyeball. If you can't find round black sprinkles (I get mine around Halloween at Walmart), just use a black edible marker to make a pupil or you could just use chocolate chips for the eyes. Now add a little white frosting the back of your marshmallow and place it on your bunny face above the nose. Repeat for the other eye. 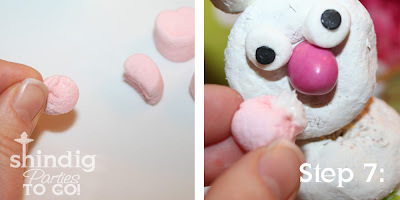 Step 7: Cut your pink heart marshmallow in half and pinch the sticky side together to make the marshmallow rounded. 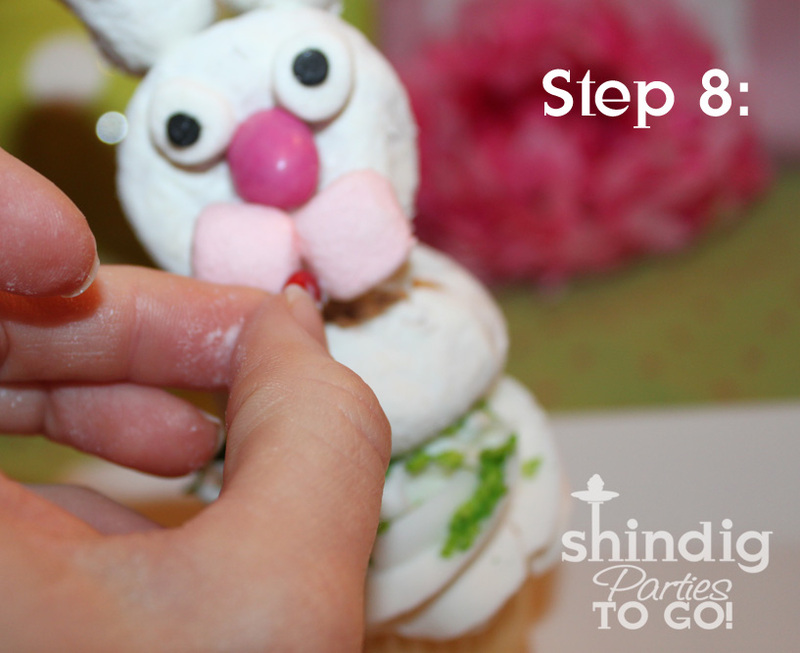 Add frosting to the back side and place under the bunny's nose to make cheeks. Repeat for the other cheek. Step 8: Add a mini red M&M in the middle of the cheeks for a tongue. You can attach it with a little frosting. Step 9: Use a clean paintbrush to brush some black food coloring onto a piece of uncooked angel hair pasta (or spaghetti noodle). Wipe off the excess with a paper towel, and then cut your noodle into pieces about 1.5" long. 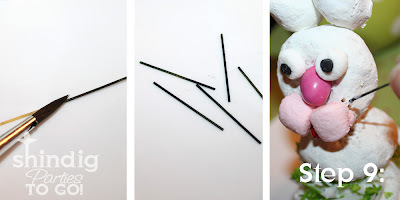 Use a toothpick to make 3 small holes on each side of the bunny's cheeks and place the noodle inside the hole with a little frosting. Step 10: Pat yourself on the back -- YOU DID IT!! Cute! Cute! The kids will love them! Just be sure to serve them to older kids and tell them about the toothpicks. If you want to serve them to the younger kids, just remove the toothpicks first. These cupcakes are adorable. What a perfect addition to an Easter dessert table. I also think, if the materials were prepared ahead, they would make a great kid project at an Easter themed party. Thanks for sharing. So cute! I don't know if the cupcakes would turn out so well if I did it! These are the cutest things ever! I SO want to try to make them! 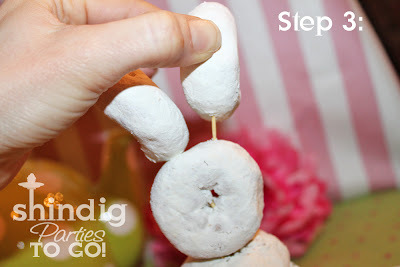 Thanks for sharing the idea, and offering such fab step-by-step instructions! I love this type of decorating, easy enough that I can do it too. Your bunny is so cute and fun. I am hosting a Spring Battle of the Cookers and Crafters linky with prizes, and this would be fabulous to link up if you wanted for a chance to win. LOVE these! I featured them on my blog!! These bunny cupcakes are crazy cute! 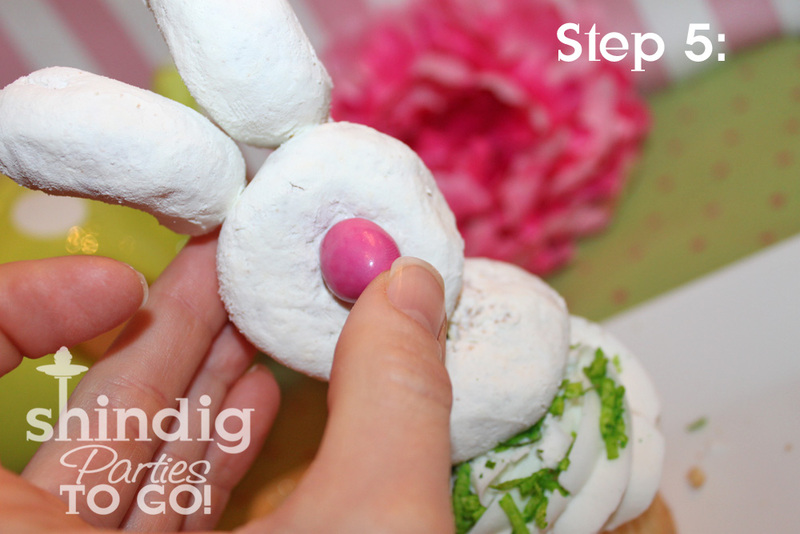 I'm definitely including them in my roundup of Easter sweets next month!